Poor Rick Perry. It's been a rough three months of campaigning, but (thank god) that all came to an end on Friday as Perry told a crowd of supporters in St. Louis, Miss., that he had suspended his 2016 run indefinitely. So what will Perry do now that he's not busy batting off attacks from rival Republicans and the Lamestream Media™? Really, he can pretty much do anything he wants at this point. It was a hard-fought effort, but now that it's over, Perry has plenty of time to focus on what really matters (like those kickass, trademark cowboy boots). It's still a little unfortunate, considering that Perry was this election cycle's Ward Cleaver when compared with his outrageous fellow candidates. "In this year’s race, the way is to shoot the moon, to speak only in gaffes," joked The Washington Post's Alexandra Petri in a column on Friday. "Rick, like France after 1918 constructing the Maginot Line, made the mistake of preparing for the last war [and] it went about as well." Since first leaving the Texas gubernatorial seat in January this year, Perry has been on a presidential roll, donning a pair of totally grown-up looking, black-rimmed glasses and doing everything in his power to not be the laughing stock of the nation (aka Donald Trump). Standing up for Mexican immigrants, and then sitting down really quickly again when the nation asked, "Who's a fan of Planned Parenthood? 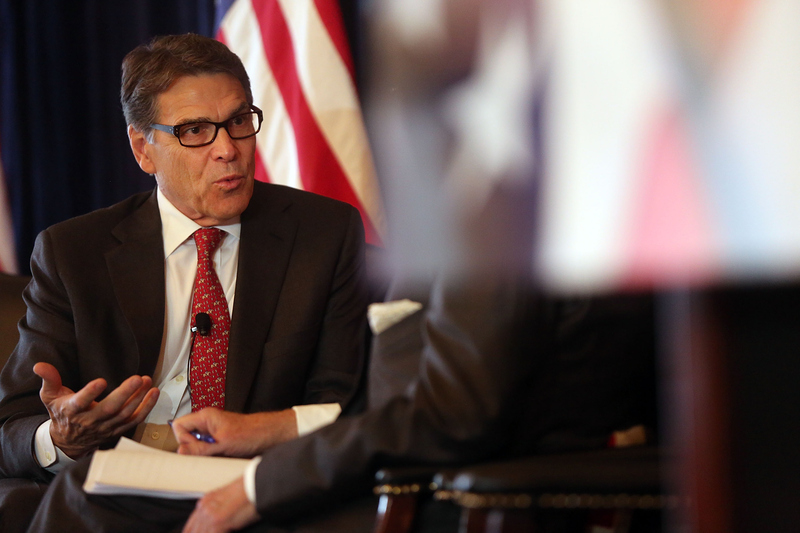 ", Rick Perry was rockin' it, showing his true conservative colors and letting that presidential aura fly high. Alas, all that effort amounted to nothing. Hovering at the bottom of the collective Republican heap with just 1 percent of the prospective vote, according to a recent Public Policy Poll, it was probably in Perry's best interest to just jump ship now, right before said ship hit a giant iceberg (because let's be honest, that's where this GOP field is headed). In a speech to a group of wealthy, conservative voters at Manhattan's Yale Club in New York this past July, Perry angrily remarked, "To be quite frank, we got screwed [by Wall Street]... and we have every right to be angry about it." He then added that the upper echelons of the financial sector had taken "aim at Wall Street and the bullet went right through and hit Main Street." Yowch. Come on guys, someone needs to make him some neon-green protest signs, and fast... Perry doesn't exactly have anything else to do at this point, and he's probably going to be here any minute. She was the daughter of a single woman, she was a teenage mother herself. She managed to eventually graduate from Harvard Law School and serve in the Texas senate. It is just unfortunate that she hasn’t learned from her own example that every life must be given a chance to realize its full potential and that every life matters. With those nasty comments in mind and all the time in the world to formulate some sort of apology without costing himself potential votes, it's probably best that Perry get to groveling now. And hey, stop skimping on the sugar, Gov, that's just rude. When asked by 2012 GOP debate moderators which government agencies he would cut if elected president, Perry famously replied, "I will tell you, it’s three agencies of government, when I get there, that are gone: Commerce, Education, and the, uh...." When no words came out of his mouth, the then-Texas Governor looked desperately to his fellow Republicans Ron Paul and Mitt Romney to pass him a note with the answers, but to no avail. "Oops," he replied sheepishly. It was the "Oops" heard round the world and effectively killed Perry's campaign right then and there, but hey — now that he's got more time on his hands, maybe he can put some more thought into it. Apparently these two notoriously hate one another (although both camps deny the allegations). According to Texas Tribune Editor in Chief Evan Smith, who spoke to The Week in 2011, "There's no question that there's tension between Bush world and Perry world" — but neither party will ever admit that to an outsider because TEXAS POLITICIANS 5EVER, BRO. If that doesn't work, they can both just go fishing and commiserate over their ruined reputations together. Sure, Perry's campaign may have depressingly run out of money, but that doesn't mean he's not still a relatively wealthy guy. Just a few years ago, The Atlantic estimated his net-worth to be in the low seven figures, even after purchases of expansive real estate and land. With that much cash, Perry could totally throw himself the best pity party the world has ever seen. We're all doing it, Rick. Come on and join in on the fun. Look, he's all warmed up already.